Michael Trasso: a real glittering prize. 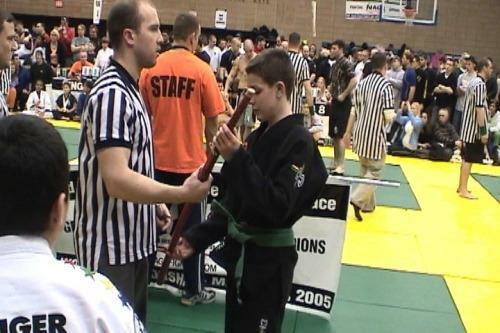 NAGA held its annual world championships at St. Peters College in Jersey City, N.J. Once again the 1st place samurai swords brought out over 1100 competitors who fought in over 165 divisions. Michael Trasso took 1st place in both Advanced Kids Gi (wearing a gi: kimono) and No-Gi Divisions. To make things less shiny on the furniture of those who think a man of Latin origin - in this case Italian - has to be hot-blooded and extremely emotional, the American grappler Michael Trasso has collected victories one on top of the other, plentiful of pure technique, mixed to a warm adoration for jiu-jitsu that renders some of his opponents seriously concerned on the mat. The frozen look that has already become a trademark for the lad upon entering and leaving the mats is the symptom of the methodical cold-thinking mind in action, more than the body itself, being supported by efficiency, little speaking and tons of doing. Living proof is, I have only received some five messages from him since I first "met" him by e-mail. However, its tricky to simply assume that he doesnt move or get moved emotionally: his history, taken by his father to a jiu jitsu academy at five to break up with shyness as his father and sponsor Ray Trasso comments, is the greatest proof of the noble feeling he nurtures towards a sport he practices with the devotion of few fighters in the world: love. Can this ever be any cold?